Piglet Bo insists that he is not scared. Not scared of anything and not scared of anyone. And if you think he seems scared, well, you’re misunderstanding the situation. Really, Piglet Bo can’t go into the dark cave because he doesn’t want to disturb the bats. And he can’t go into the deep pit because he’s pretty sure the termites are having a birthday party and it would be rude to show up without a gift. But what are those shadows lurking on each page? How long can Piglet Bo’s excuses last? Geert De Kockere’s whimsical story will capture the hearts of children and adults alike. This playful tale of a pig who just can’t admit he’s afraid is sure to get kids laughing out loud. 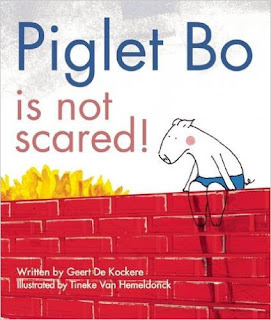 Tineke Van Hemeldonck’s uniquely evocative mixed-media illustrations bring Piglet Bo Is Not Scared! to life and give it an imaginative, quirky feel. This charming story is for ages three and up. Geert De Kockere studied to become a teacher but instead became a professional journalist, working for the Flemish newspaper De Standaard (The Standard). Currently, he is the editor of Buitenbeen, a nature magazine for Flanders and the Netherlands. He has written many children’s books, including several collections of poems, and has won a variety of book prizes for his work. He lives in Kempen, Belgium. Tineke Van Hemeldonck studied graphic design, specializing in illustration, at Provinciale Hogeschool Limburg in Hasselt. She has done all kinds of graphic design work and has illustrated several children’s books. She currently resides in Bunsbeek, Belgium. Piglet Bo Is Not Scared! by Geert De Kockere is the perfect book for kids for kids 3 and up! My daughters love this book. We have another Piglet Bo book so my kids were thrilled to read this one. Piglet Bo isn't scared of the dark cave, he just doesn't want to disturb the bats. This playful tale of a pig who just can’t admit he’s afraid is adorably cute and gave my kids a few laughs. By the end of the book Piglet Bo is finally ready to admit that maybe, just maybe he's a tiny bit scared. Such a fun book! My kids also enjoyed finding the wolf shadow hiding on each page. The illustration are fun and match the story perfectly! 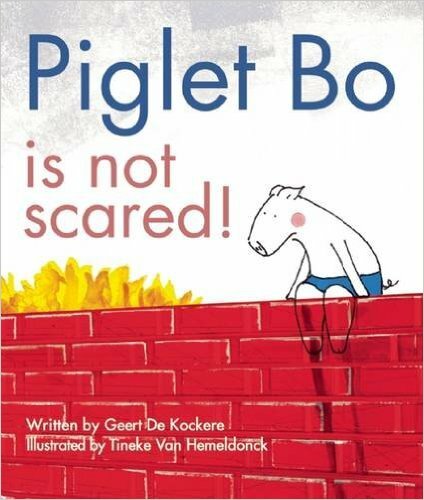 You can find Piglet Bo Is Not Scared! by Geert De Kockere on Amazon, Barnes and Noble and other bookstores.